We received an exciting email on Monday of this week...our homestudy was approved by the state DHR and was sent to the USCIS last Monday (the 14th). YIPPEE! That's progress, folks! We also have submitted our first set of dossier documents, which is required for us to get our first travel invitation from Russia. That is the trip where we will meet Sarge for the first time and accept his referral. We will also petition the court for a court date to formally adopt him on that trip. Sadly, we will return to the U.S. for several weeks while we wait for that court date without our Sarge. But, we plan to stay busy preparing for his arrival. So, the bottom line is, our dossier has been submitted to the USCIS. Now we wait for them to approve it. Then it is sent to Russia. Then Russia translates it, approves it, and gives us a travel date. There's nothing else for us to do except wait to get our travel date! Please pray that all of that happens quickly. We have been told by our social worker that it could be as early as late January!!! Look at this blond-haired, blue-eyed angel! Her name is Victoria and she is in the same orphanage as our John Sergeant. I can't wait to see her in person when we go visit him for our first trip. I know it will be hard to leave her behind because she needs a forever family too! That's the hardest part of adoption; when you choose one child, it feels like you are turning down the rest of them. It's a really sad feeling, because you know that it's just by the grace of God that your child will be coming to a loving home while so many others will be staying behind in orphanages. Without mommies. Without daddies. Without brothers or sisters or grandparents. They are alone except for the workers who care for them. Although these workers may be loving, they have many children to care for and simply cannot give children the individual attention they need to thrive. It breaks my heart. So, that's why I'm a Prayer Warrior for Victoria this Christmas. My goal is to raise 1,000 dollars for her grant fund so she will be more likely to find a forever family. As I've said before, there is no shortage of families who want to adopt these children, just a shortage of funds. 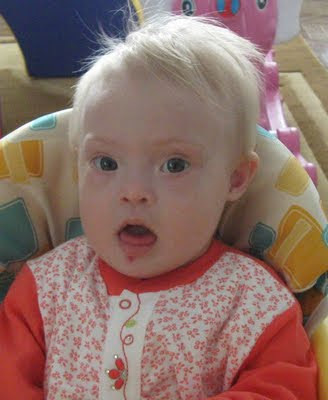 No matter how small the amount, a donation to Victoria's grant fund will bring her closer to having a family to love her. You may click on the Christmas ornament in the lefthand column to go to the Reece's Rainbow Angel Tree. There you will find instructions on how to donate to Victoria's grant fund. Please prayerfully consider donating. It will change a life forever. Guaranteed.